space availability for POS positions. When these are on the back counter, menu items may be reduced because there is not room for equip- ment. Something must go." In addition to beer, concessions offer fountain and packaged soda, iced tea, sports drinks and bottled water. The two Flash Point Grill locations (separated by the other concessions) contain full kitchens with a charbroiler for hamburgers and black bean burgers, a combi oven for steaming hot dogs and two fryers. "In Chicago, people ex- pect steamed dogs with all the fixings," Cole says. Flash Point Grill and other concessions feature a popcorn popper and nacho cheese dispenser. "With the Chicago Dogs name, it made sense for Impact Field to offer a lot of hot dogs," general manager Stephens says. The exception to steamed hot dogs are the grilled dogs at Wieners Circle, a famous Chicago operator that expanded to its first outside-the-city location with Impact Field. Cole's team manages the operation and serves key items featured at the Lincoln Park location. Staff grill the dogs on a charbroiler with ceramic bricks that heat up like coals during usage. Wieners Circle's claim to fame resides in its "sass" customer service. However, Cole explains, "the sass is toned down a bit for the family-friendly baseball environment." Pies concession features three pizza varieties — cheese, sausage and pep- peroni — that staff cook in a conveyor oven. The back-of-the-house (BOH) area splits in half to allocate space for both pizza service and in-seat service and catering. The operations team rezoned this BOH shortly after the season began to improve efficiency for catering and in-seat service. Prior to the change, staff had to traipse back and forth all the way from the main kitchen, a roughly 10-minute walk. "We realized that catering staff needed a home closer to the party decks," Cole says. "So we zoned areas within the concession areas for holding catering foods. Now it takes staff mem- bers two minutes to bring what they need to the party decks." An elevator also helps expedite service and enables direct access to the pantry/storage. 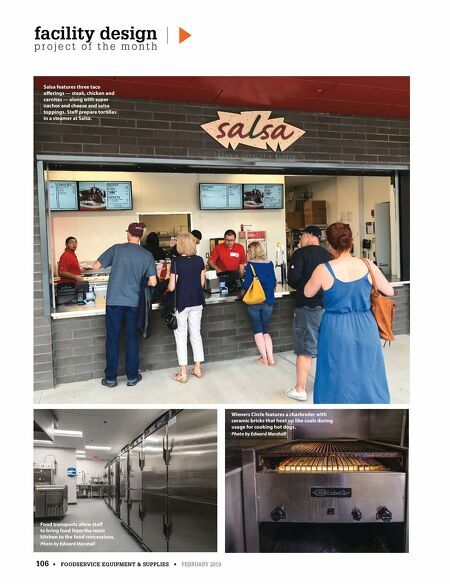 The BOH areas at Pies and one Flash Point Grill location are larger than other concession stands to allow vending/hawkers and in-seat service staff to function without getting in the way of the concessions operations. 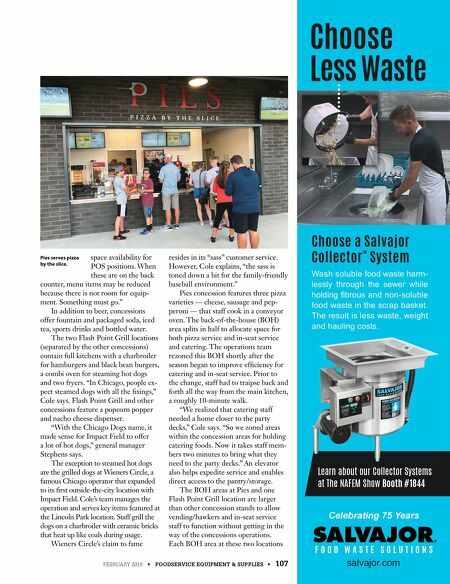 Each BOH area at these two locations FEBRUARY 2019 • FOODSERVICE EQUIPMENT & SUPPLIES • 107 salvajor.com F O O D W A S T E S O L U T I O N S Celebrating 75 Years Learn about our Collector Systems at The NAFEM Show Booth #1844 Wash soluble food waste harm- lessly through the sewer while holding fibrous and non-soluble food waste in the scrap basket. The result is less waste, weight and hauling costs. Choose Less Waste Choose a Salvajor Collector ™ System Pies serves pizza by the slice.